Los Angeles Nininger Chapter display at Fort MacArthur CA, July 9-10, 2010. More images and comments here about PSHS at old Fort MacArthur Days. Gil Mislang made an effort to get the gear out there even if he was hurting when he walked around. 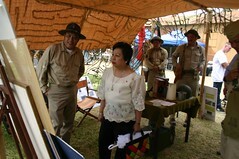 Through his personal efforts, Gil was able to get the Phil Consul General of Los Angeles come out and see the event. Since she was Gil's guest he had to accompany her down the hill to see the other display time lines. Gil hobbled along in stride to get back up to our display. The display panels from PS collection we put up on the edge of the tent made for better reading by visitors. But some may say it took away from having to engage (talk to) the public about the accomplishment of the PS, as living historians should do. But it gave time for us to welcome each visitor to the exhibit and kept them occupied while we answered an earlier visitors question. We talked about making it to White Sands in March of 2011 and setting up a display there also. Please forward the information to those you know in Southern California. There will also be an exhibit at the Long Beach, CA city library that will open on 9 Oct. 2010, on the liberation of the Philippines that will run for the duration of Filipino-American heritage month.